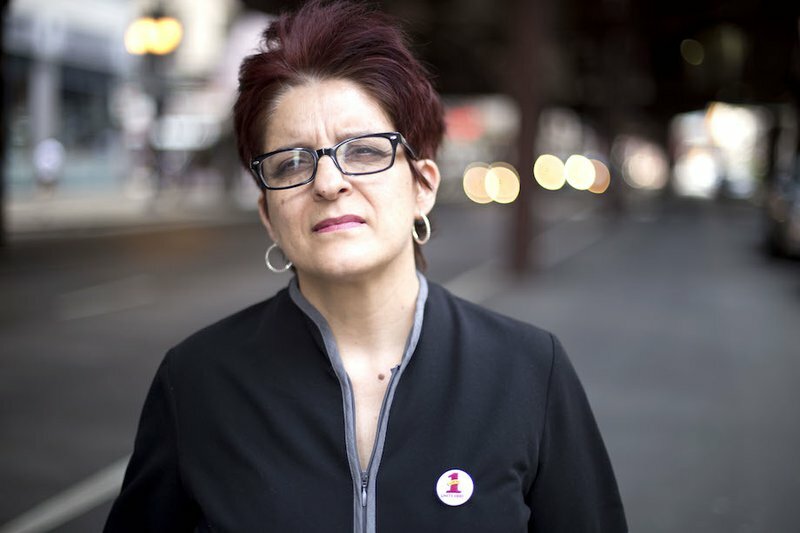 Too many women in Chicago’s hospitality industry are experiencing gender-based abuse at work – and women are speaking out to change that. Photo by Noah Dobin-Bernstein, UNITE HERE Local 1. Hotel housekeepers, bartenders, waitresses and cocktail servers – the majority of whom are women of color and immigrants – form the backbone of Chicago’s booming hospitality and tourism industry. Now these women are speaking out about their experiences of widespread and disturbing sexual harassment from guests. And they are calling for an end to the abuse. They are a part of the “Hands Off Pants On” campaign, a public awareness and legislative initiative to fight sexual harassment and sexual assault in the hospitality industry. • 49% of housekeepers surveyed have had guest(s) expose themselves, flash them, or answer the door naked. "I came to Chicago from Durango, Mexico for a better life. I am a proud mother of two and the grandmother of four wonderful grandkids. As a single mom, I took the job as a housekeeper to support my family. I have worked as a housekeeper at a downtown Chicago hotel for the last 8 years. With my union, UNITE HERE Local 1, we have won living wages and good health insurance at my hotel. I am proud of the hard work [that] my co-workers and I do every day. I put all of my heart into my job and I want to make sure the guests have a good stay at the hotel. But some days it is hard to come home to my grandkids with my head held high. I have been sexually harassed by guests of the hotel. It makes me feel small and afraid. I’ve had instances where a guest answered the door completely naked. And more than once, a guest has masturbated in my presence. It is difficult to describe how horrible and degrading those experiences are. Every day when I knock on a guest room door, my legs start shaking. I worry: “What am I going to find? Am I safe in this room?” I decided speak up because I know this happens to other women I work with. I want a safer world for my grandkids and I know nothing can change if we remain silent. Now, with the leadership of President Jorge Ramirez, the Chicago Federation of Labor is spearheading an effort to protect hotel workers against sexual harassment and assault. We are fighting to make sure that every Chicago housekeeper is equipped with a panic button. This means I will be able to call for help if am in a scary situation with a guest. I will be able to breathe a little easier at work. I believe because these efforts, more of us will come forward when we are sexually harassed by a guest. I am proud that we are making hotels safer for my co-workers and the women that come after us." Photo of Esthela by Noah Dobin-Bernstein, UNITE HERE Local 1.